Diane S. Christensen, ’69, Fountain Valley, Calif. The outcome of the 1980 Holiday Bowl was so unfathomable that the “Miracle Bowl” has become an accepted name for the game. But the masses have never known why the miracle occurred. Oh, they may have watched from the stands, seen the replays, read the headlines, or heard the retellings—but these were only the execution of the miracle. It’s possible the directive for the event came from the electronics department of a Sears store many miles away. John Schlottman had been avoiding the plea of his fiancée to listen to the Latter-day Saint missionaries. His gut was telling him that this might require a full, spiritual commitment for a lifetime. While shopping at the mall in Huntington Beach, Calif., he paused in front of a bank of televisions and saw that BYU was down 20 points with less than three minutes to play. John declared, “If BYU wins this game, I’ll take the missionary lessons,” and he kept walking. On Sunday morning, he read the headlines. Today John is in my ward, and Jacob, the first of John’s four sons, is serving a mission in Ecuador. And we thought it was all about football. Adam Douglas Ford, ’96, Astoria, N.Y.
Several years ago, when I was a graduate student at Duke, I was among a few BYU alumni who went out to see the NCAA track and field meet in which BYU competed. There were many wonderful moments, but the 1,500-meter run by Susan Taylor Nielsen, ’01, stands as one of the most exciting, most emotional sporting events I have ever been privileged to see. She came out strong in the lead. Supporters were excited and yelling loud. At lap two she had been passed by a few runners and at lap three by a few more. We were cheering enthusiastically, but someone expressed that the group was beginning to get too spread out for her to make a comeback. It was becoming clear that Sue would never catch the leader—the defending champion from Villanova, who had opened up a slight gap on the pack. Sue worked her way outside on the front corner. It must have been hard to slow down slightly to get around other runners and get outside. Down the backstretch she moved into fourth place. We were going crazy at this point. Could she really do it? Taking the long outside on the final corner, she moved into second. It seemed that she was in a whole different class, passing the other runners with seeming ease. And then she rocketed onto the straightaway and into first. We were jumping up and down. Then the whole stadium took notice and was on its feet. Down the final stretch Sue pulled away and won handily to roaring applause. How proud we were of her and of her representation of BYU! I’m pretty sure that Sue cried after her win. I know that many fans were moved by her performance. One older fellow wearing a University of Florida uniform told us it was one of the greatest wins he had ever seen. It stands as a shining example of the triumph of the human spirit. It was Sue’s great moment, and it was an honor to witness it. Bravo, Sue, bravo. It was an unusually hot autumn day—90 degrees, at least—on Sept. 8, 1990. My dad, Myron D. Johnson of Richfield, Idaho, 73 years old, came with me to watch the Miami vs. BYU football game. We arrived very early, as we liked to watch the pregame warm-ups. My father is a single amputee, having lost a leg in his teenage years. He is agile on his crutches, but the climb up the ramp and the stairs to my upper-deck seats exhausted him, despite frequent rests. At our last rest before reaching our seats, Dad sat next to me and lapsed into semiconsciousness, his eyes rolling back in their sockets. I held his head in my lap and looked around to try to find some help. A lady nearby asked if I needed help, and I answered in the affirmative. The medics arrived quickly. Dad was conscious enough to indicate that he didn’t want to leave—he came to see the game, and he was bound and determined to stay. The medics gave him emergency treatment and placed him on a gurney, and we were on the way to the hospital with what appeared to be a heart attack. I said I would follow behind in my car as the ambulance rushed him to the hospital. I thought, I will never see the game now, and nearly looked to see if anyone wanted to purchase my tickets. Upon examination at the hospital it was determined that Dad was suffering from exhaustion and not a heart attack, so he received permission to go back to the game. He returned in the ambulance with me behind. I received a wheelchair at the gate for Dad. I told the security people that Dad had been taken to the hospital, and that there was no way he could make it up to my seats, so he sat on the lower level in a wheelchair area while I returned to my seats and reveled in a terrific game as BYU defeated the No. 1-ranked Miami Hurricanes 28-21. Who could forget the key defensive stop of Lisiate A. (Rich) Kaufusi, ’92, on a crucial fourth-down play, Ty H. Detmer, ’92, and how he scrambled until he found Michael G. Salido, ’90, from seven yards out for the winning touchdown, the interception of Craig Erickson’s pass by Erwin D. Lee, ’92, or the fourth-quarter pass deflection in the end zone to ensure the victory? What a moment to remember. During the Civil Rights movement at the end of the 1960s, education at many colleges around the nation came almost to a standstill as students rioted and rebelled against the leaders of their schools. There wasn’t rioting or protesting at BYU, but BYU was still affected. Because most BYU athletes were white and because of the policy of the Church of Jesus Christ on the priesthood at that time, many people across the nation accused BYUof being bigoted and discriminatory. Some schools protested through sports. At one basketball game in particular, there were rumors that there would be trouble, and everyone worried about what would happen. Supposedly, members of the other team planned to fight and totally disrupt the game. BYU had a winning basketball team that year. 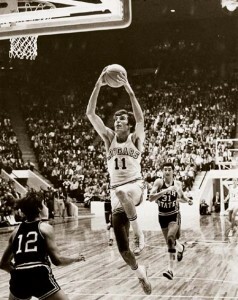 One outstanding player was Kresmir Cosic, ’74, a Yugoslavian who wasn’t a Latter-day Saint. When the game began, the other team seemed filled with anger and played roughly. They seethed with bad will and tried to provoke the BYU players in every way. But Kresmir turned that volatile situation back into an athletic competition. Kresmir clowned a lot as he played. His abilities were so outstanding that he could outplay the other athletes while having fun doing it. His good humor and sense of fun was contagious. He changed the bad feeling of many athletes and commentators to understanding and goodwill. I remember laughing hard at some of his antics. The opposite team couldn’t stay mad when he played. Kresmir later joined the Church and graduated. Instead of accepting an offer to play professional basketball in the United States, he chose to return to his native country. He felt he was needed there. For many years he trained and played with the Yugoslavian Olympic team, even leading them to win the gold medal. Later, when his country divided, his skills of diffusing tense situations were called into play again as he was assigned to be Croatia’s deputy ambassador to the United States. Not many years after this assignment he passed away from cancer. There are those, including myself, who remember him as a hero because of his courage and cheerfulness in that tense situation.